After receiving two beautiful fresh crisp cos lettuces from the Wendy, the wife of my French language teacher, I just had to re-visit the recipe for a Caesar Salad. Place the bread on a baking tray and drizzle with olive oil. Place in a preheated oven 200˚C and bake until crispy and golden on the outside, but still soft on the inside (approx 10 minutes). Place all the dressing ingredients into a blender and blitz until nice and creamy, but not thick. Season to taste. Select four beautiful large cos lettuces leaves and set aside for serving. Break the remaining leaves into pieces, or alternatively shred them into 2 cm strips. Cut four bacon rashers in half on the angle and then the remaining rashers into batons, and fry until crisp, but not burnt! Meanwhile, bring a pot of water with a dash of white vinegar added to it, to the boil. Reduce the heat to just simmering, and then, using a spoon, stir the water. While the water is still swirling, break in the egg (this helps to keep the white together) and cook for approximately 3 ½ minutes for a nice soft yolk. Using a slotted spoon, remove the egg to a piece of paper towel to drain, and cook remaining eggs. 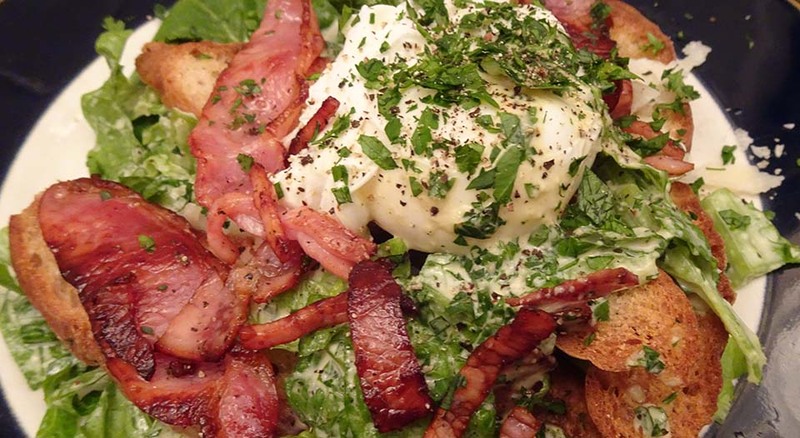 In a large bowl, gently toss the lettuce together with half of the bacon batons, half of the parsley and approximately 2 tbs of the dressing. Place a large lettuce leaf on each of the serving plates and top with the dressed salad. Arrange three slices of toasted sourdough on each, then place the larger pieces of bacon on top of these, and scatter over the shaved parmesan. Finally, carefully place the poached egg on top, sprinkle with any remaining small pieces of bacon, some parsley and a final flourish of freshly ground black pepper. Store leftover dressing in a jar in the refrigerator. The dressing together with the bacon and parmesan make this dish quite salty, so be careful not to over season with salt. It is important to use fresh eggs for poaching, as the fresher the egg, the better the white stays together.